Fine ‘character’ houses stand opposite the college entrance in Hadham Road, many, at some time in the past, associated with the college. No 68 was opened as a temporary boarding house in 1918 and No’s 90 & 92 (formerly Westgrove House) opened for the same purpose in 1924. At that time the house was already owned by the college’s medical officer, Dr John Young, and two years previous had accommodated classrooms on the ground floor. Dr Young moved out in 1928 but it remained a boarding house for a further ten years. 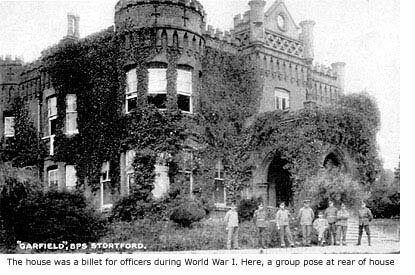 Westfield Lodge (No 94) was a boarding house between 1903 and 1933, as was the imposing structure of No 96, formerly known as Waytefield. This accommodated pupils from 1917. To begin with only half of the house was used for boarders but it was fully utilised for the purpose between 1922 and 1938 and later became Hayward House. Beyond this building is Springfield Court, a large, modern apartment block that stands on the final site of Bishop’s Stortford Grammar school. Named the High School by Rev Rhodes when he founded it at Church Street in 1850, it was renamed the Grammar School after moving to this site around 1860. In the early 1900s it was more familiarly known, locally, as the Bruce-Payne school (See Guide 3 – The Old Grammar School). But by the late 1920s a lack of finance brought on by stiff academic competition from the nearby college finally forced the school’s closure and the two subsequently merged. The actual date of closure is uncertain, although the Herts & Essex Observer (15 November 1963) gives the year as 1929. The building was converted into apartments shortly after but in 1979 the site, including former playing fields, was bought by a property developer and demolished to make way for Springfield Court. The only part of the school to survive is its former chapel, erected in 1893 in memory of the school’s first headmaster on this site, Rev Goodman. Currently used as the local Masonic Hall, it at least gives us some idea of how the rest of the school once looked. Adjacent to Springfield Court is Hadham Court, private apartments fronted by a restored timber-clad building that was once a malting. In its heyday Bishop’s Stortford’s malting industry comprised of many small malthouses like this one, most operated by just one or two people. Now a private residence the building still retains its original kiln chimney. On the opposite side of the road is Pye Gardens, a new development of contemperory style houses completed 2006. A property of genuine substance, however, is No 119 Hadham Road – a truly amazing Gothic pile that wouldn’t look amiss in any Agatha Christie thriller. With ornate red brickwork, battlement features and turrets, this house was built between 1900 and 1903 by a man named Daniel Congdon. It was very likely he who gave the house its original name *Carfield. He was a farmer at Knights Hill, Westmill, Buntingford, and originally came from Cornwall where his family had been farmers in Week St Mary for generations. He had two daughters. The land on which he built this property was purchased in 1900 from George Hughes Abbott (1862–1908), who at that time lived at the corner of Maple Avenue in a house thought to have been built around 1890. Despite Congdon’s apparent wealth in buying the land and building this magnificent house, it appears it may have been his downfall because in 1906 his mortgagers held the title. Ownership after this date is unknown but during the First World War the house was used as a temporary billet for officers, their only (recorded) complaint being the lack of indoor sanitation. To ‘perhaps’ compensate for this inconvenience they were later given access to a chemist’s shop that had been installed on the ground floor of the house. In 1918 the owner was Edgar Carruthers of town drapers Carr and Bury, who was also a former town mayor and member of Bishop’s Stortford Urban District Council. At his death the property passed to his son, Hugh Boyton Carruthers, and in 1948 was sold at auction to Violet May Franklin. That same year the property was split into two parts and is recorded as being a hostel for Herts County Council, possibly used by people displaced during the Second World War. On 1 January 1949 the Herts & Essex Observer reported a change of use, the house becoming a private residential hotel where luncheons and teas were also available to non-residents. How long the hotel remained in business hasn’t yet been established, but in 1954 the property was sold by Violet Franklin to Clayden Contractors. They then sold it on as three separate pieces, 1955–1957, two of which were as living quarters: No 119, called Greenway, and No 119a called Carfield. In 2003, new owners converted the house back to one residence, at the same time landscaping the grounds to a very high standard. *From early on, the property’s castle-like appearance had always led local people to refer to it as ‘The Castle’. Not wanting to lose this familiar identity, or its original 86 year-old title, the new owners combined the two titles and renamed it Carfield Castle. A name long associated with the town is Arthur Sworder, who once lived at Thornfield House in Hadham Road. His brothers, Herbert and George, also occupied large houses nearby, but it was Herbert who gave the town Sworder’s Field – the children’s play area on the Meads at the bottom of Hockerill Street (See Guide 9 – Hockerill Street). Near the top of the hill on the left-hand side is Stort Lodge, a fairly modern housing development that takes its name from the original large house that stood on this site. Commanding almost 7 acres of land it was owned in the 1800s by the Wilby family, who for many years rented it out to Walter Gold at £105 per annum. (Gold was a member of one of the families who were partners in W. A. Gilbey Ltd.) When W. Wilby died in 1903 his entire estate was sold at auction and Stort Lodge was bought by Sir John Barker for £2,500. Among Wilby’s other properties sold at the same auction was Marsh Barns – a house and land stretching between Hadham Road and Maze Green Road that in the early 1970s was developed for housing. Apparently named after the owner of the road, Maple Avenue was the scene of an important discovery in 1910 when a local builder, Joseph Dorrington Day, unearthed the bones of a large animal while preparing foundations for a new house. On the advice of Dr Irvine, naturalist and vicar of All Saints, Hockerill, the bones were taken for safety to Featherbys works in London Road (See Guide 12) where they were preserved and assembled. Said to be the bones of an Iron Age horse, the skeleton was later put on display at the Natural History Museum, London. Today would leave you in the cold.